Sustainable, high quality, specialty coffee. Our commitment to environmental, social and economic sustainability puts us at the forefront of the industry. Roasting in Richmond, VIC Australia. Discount on Bodum available until 11:59pm 31st May 2018. Chances are you have a french press (or plunger) sitting in the back of your cupboard. This tried and tested filter coffee brewing method can deliver a full bodied, complex and satisfying brew. French press is full-immersion brew method – meaning that the coffee grinds sit and steep in the hot water, not drip through it. It is this simplicity that leads to a consistent brew each time and makes it the perfect option for brewing multiple cups at once. There's a social aspect to the french press. It was designed for sharing. You don't need lots of concentration like other manual brew methods. Simply weigh the coffee, add your water and chat away while the coffee brews. After 4 minutes, press down the plunger and pour the coffee. Always start with a clean, pre-heated french press. After 4 minutes press down the plunger to finish the process at 4:30mins. Pour into cups straight away or decant to a pre-heated coffee pot to prevent over-extraction. If you remember the brew recipe and basic brew method, and clean the french press well after each use, you will always brew a great cup. Like any coffee maker, your Moccamaster needs regular cleaning to remove oils and mineral deposits (limescale) and to keep your coffee tasting clean and taint free. Using filtered water will result in a better tasting coffee and will reduce limescale build up. After each brew, rinse and wipe out the plastic filter basket and the carafe. For stubborn oil build up, use warm soapy water and rinse thoroughly to remove all traces of soap and fragrance. We recommend descaling your Moccamaster after every 100 brew cycles. If you use it every day this means descaling every 3 months. Moccamaster’s warranty does not cover damage due to limescale – so stick to the recommended descale intervals. Limescale is a hard, chalky deposit of calcium carbonate that occurs from the chemical reaction of heating water. It mostly occurs on metal surfaces like the copper heating element. The build up results in a gradual deterioration of flavour and reduces water flow and temperature stability. 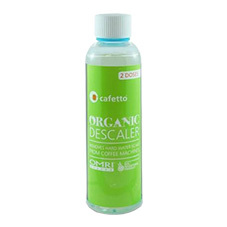 We recommend using Cafetto Liquid Organic Descaler. Pour one dose (125ml) into the tank with cold water. Run a brew cycle – without coffee or filter papers of course. Tip out the hot liquid and drain the unit of residual water. >> For Classic and Thermal models, remove the lid and drip arm and tip out over the sink. >> For Thermoserve model unscrew the drain cap and tip out over the sink. Fill the tank again with fresh, cold water and run another 3 brew cycles to flush the unit clear of any lingering residue. Don’t use vinegar, citric acid or baking soda as they will impart more flavour taints than they remove. Cafetto Evo powder in the cold water tank (used for back flushing espresso machines) won’t dissolve adequately and will clog. Sales & Support Team now on the ground servicing Northern NSW and South East QLD from Byron Bay, Gold Coast to Brisbane. Interested? Get in touch.